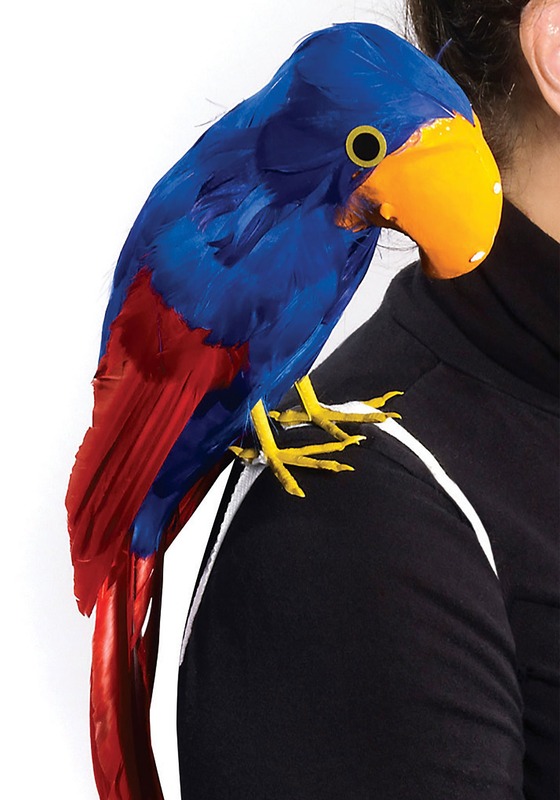 Stuffed pirate parrot accessory that can sit on your shoulder. What's up with pirates and parrots anyway? Maybe it would be more practical for them to carry around a little dog? Or maybe they have command a hoard of rats? Actually that sounds terrible and a great way to spread disease. Apparently pirates with parrots were first started by Robert Louis Stevenson's classic novel Treasure Island. Actual historical evidence of pirates carrying around parrots is pretty much non-existent other than the pirates who bought and sold stolen birds. That doesn't stop us from using them with our pirate costumes today though. Having a great bird by your side is the mark of a real swashbuckler. It shows that you've taken to the high seas and the only man or beast you care about is the parrot on your shoulder. And if anyone questions your manliness, or let's say your pirateliness, that bird will take him down a peg by repeating back what he says. Oh...well, hopefully he'll repeat something really tough. So here's our Pirate Parrot Accessory to make your pirate complete. 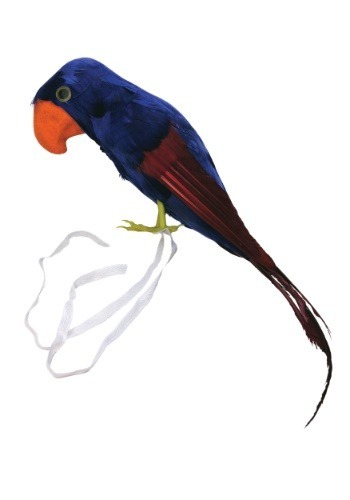 This parrot is stuffed and attaches to your shoulder with white elastic. Your pirate costume is complete once you add a sword and this stuffed red bird! It broke as soon as You tightened the strings. Complete junk. Cute parrot but beak had chunks of color missing that I have to paint over or some how color in. This is a cute parrot toy that works great with the Ace Ventura costume. I got several nice comments from strangers on him. Now that Halloween is over I put him up on top of my bookshelf.